We can only imagine the healthy competition that goes on between Toyota and sister company Lexus – the latter continually striving to be the luxurious alternative to Toyota’s everyday machines. The latest Sport Yacht concept is the product of said competitive spirit, as Toyota President Akio Toyoda took one look at the Toyota Marine Department’s preparations for a new range of premium Ponam yachts and thought to himself, “we can make these even more Lexus-ier”. 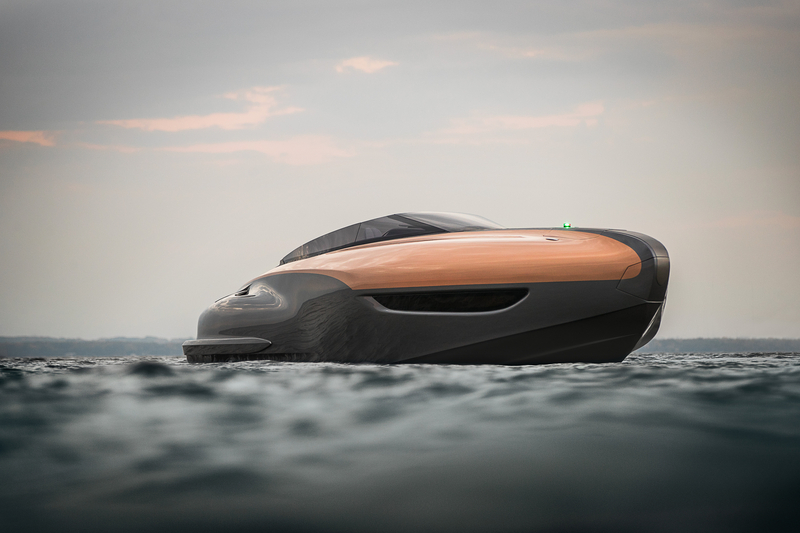 As a result, a brief was given to two separate teams at the Lexus Design Centre in Japan to create an open sport yacht for recreational day sailing. It had to be able to accommodate six to eight people and must be powered by twin high-performance V8 engines. What you see in front of you is the result of the hard work and creativity. 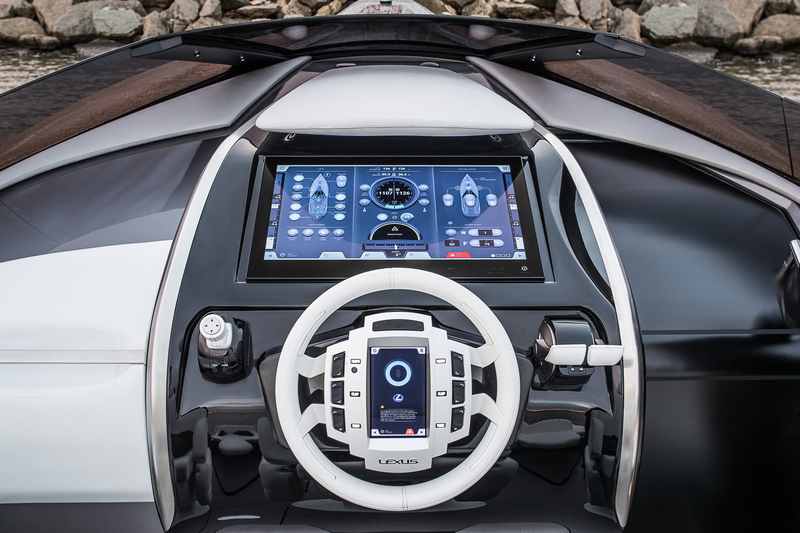 Hand-built by the Marquis-Carver Yacht Group, based in Wisconsin, it’s fashioned from hand-laid Carbon Fibre Reinforced Plastic (CFRP), similar to that found in the awesome LFA supercar, and boasts functioning twin 5.0-litre V8 petrol engines, based on the high-performance unit seen in the Lexus RC F coupe, GS F sport saloon and the new LC 500. 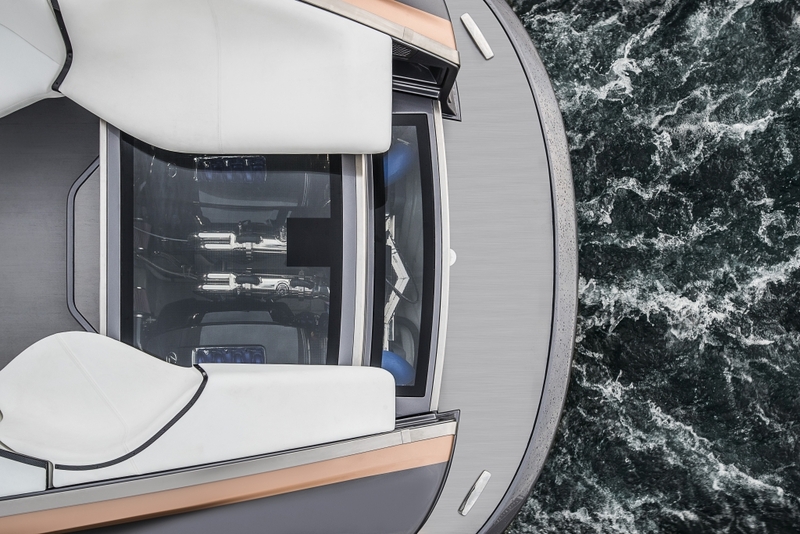 Each engine produces more than 440bhp, driving the yacht to speeds of up to 43 knots (49mph) through a pair of hydraulically controlled inboard/outboard stern drives. According to a Lexus spokesperson, something called a ‘bow-thruster’ with ‘additional joystick control’ helps park the 12.7m plaything. On-board, there’s just about enough room for eight people, with a standing-height forward passenger cabin finished in luxurious Lexus leather with wood and glass details. There’s also sofa seating for six, a dining table and air conditioning. A Mark Levinson Reference digital amplifier and fully-integrated audio and video entertainment system provides the sounds and sights, while on-board 4G Wi Fi adds further connectivity. Expect to find a two-burner stove, sink and under-counter refrigerator in the galley, as well as a shower unit located in the head. Naturally, Lexus stresses that this is just a concept and it has no plans to put it into production, which is a shame.